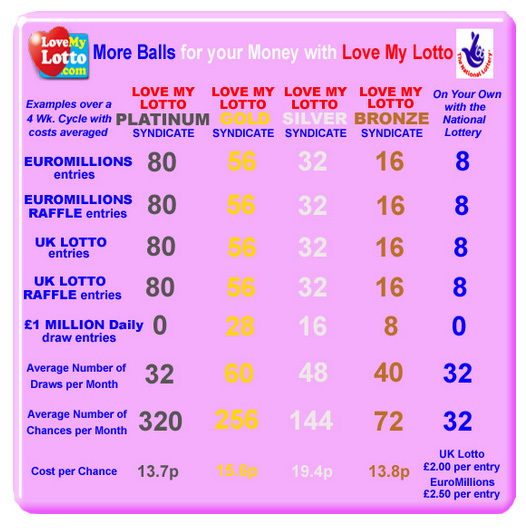 "Love My Lotto - The World's First Multi Lottery Syndicate"
A now very well established Lottery Syndicate system that has been around for a few years now is the Love My Lotto syndicate program based in the UK that covers 5 separate lotto games. LoveMyLotto proudly claims to be the world's 1st all-inclusive, multi-lottery syndicate system. Launched in December 2010 – LML is based in Stratford-upon-Avon in the United Kingdom and offers players the opportunity to increase chances of winning lottery games by playing as part of a multi-game lottery syndicate. It is a well known fact that 1 in 4 lottery jackpots are won by lottery syndicates – and LoveMyLotto provides a great product that will boost your chances of trying to win the lottery. Love My Lotto is pretty unique among lottery syndicates in that it offers lotto syndicates for multiple lottery games all in one. There are 5 games covered by each lottery syndicate – the EuroMillions, EuroMillions Raffle, the UK Lotto and the UK Lotto Raffle from the UK National Lottery as well as the unique, Monday to Sunday £1 Million Jackpot Daily Draw. In a lottery syndicate with LoveMyLotto you will be playing for up to 320 chances to win in up to 60 separate draws every 4 weeks. The cost of playing with LoveMyLotto is very favourable compared to playing any of the National Lottery games by yourself as you will see clearly from the comparison table that is illustrated below. This is a great way to play the UK Lotto game from the UK National Lottery – as you get far more value for money when playing in a UK Lottery Syndicate than by playing alone. Love My Lotto syndicate members get between 16 and 80 separate entries into the UK Lotto every 4 weeks plus between 16 and 80 entries into the UK Lotto Raffle additional game. As well as your UK Lotto entries, your syndicate will also get between 16 and 80 separate entries into the huge Euro Lottery – EuroMillions – plus between 16 and 80 separate entries into the Euro Millions add-on game – the EuroMillions Raffle. In addition to the UK Lotto, UK Lotto Raffle, EuroMillions and EuroMillions Raffle entries – your LoveMyLotto syndicate will also receive between 8 and 28 separate entries into the very exciting and unique £1 Million Jackpot Daily Draw every 4 weeks. Therefore in total – by playing as part of a lottery syndicate with LoveMyLotto – you would be entering anything from between 32 and 60 separate draws every month and would enjoy an average of between 72 and 320 separate chances of winning the lottery . In addition to your 16 to 80 UK Lotto entries you would also receive anything from between 16 and 80 entries into the additional UK Lotto game – the UK Lotto Raffle. Your lotto syndicate would then benefit even further from between 16 and 80 entries into the huge EuroMillions lottery plus between 16 and 80 EuroMillions Raffle entries and between 8 and 28 entries into the £1 MILLION Daily Draw jackpot game. Let’s now look at the LoveMyLotto syndicate system from the perspective of playing as part of a EuroMillions Syndicate. Members of a Love My Lotto Euro Millions syndicate get between 16 and 80 separate entries into the Euro Millions every 4 weeks and on top of that will also receive so much more! In addition to your Euro Millions entries your LoveMyLotto Syndicate will also automatically get between 16 and 80 separate entries into the EuroMillions add-on – the EuroMillions Raffle. On top of your EuroMillions and Millionaire Raffle entries – your lotto syndicate will also get between 16 and 80 separate entries every 28 days into the the UK National Lottery – UK Lotto. As well as all this – you also get between 16 and 80 separate entries into the UK Lotto additional game – the UK Lotto Raffle. If that still wasn’t enough – your LoveMyLotto syndicate will also benefit from between 8 and 28 individual entries into the special daily £1 MILLION Jackpot draw with a £1 MILLION top prize. Once again – by playing as part of a lottery syndicate with LoveMyLotto – you would be entering a total average of between 32 and 60 separate draws every 4 weeks and would enjoy an average of between 72 and 320 chances of winning the lottery. A whole lot more entries for your money, that is guaranteed! You will easily have got the picture from above we’re sure – but just to reinforce what you have available by playing in a lotto syndicate from LoveMyLotto, we'll carry on the explanation. Between 16 and 80 separate entries into the EuroMillions draw itself, between 16 and 80 entries into the main UK Lotto game, between 16 and 80 entries into the UK Lotto Raffle and between 8 and 28 separate entries into the £1 Million Daily Jackpot Draw. We believe the LoveMyLotto syndicate system is the ONLY lotto syndicate system in the world that gives you entries into a draw every day of the week for a top jackpot prize of £1 MILLION. The Daily Draw takes place every day of the month and has a DAILY jackpot of an exciting £1 MILLION. LoveMyLotto syndicate players get between 8 and 28 separate entries into this draw. The game is based on the highly popular 49s game that comes from the Irish Lottery twice a day – and the numbers used are the same numbers used in the Irish Lotto 49s “TeaTime” draw. This is indeed a great addition to a lottery syndicate system that already includes everything mentioned above – at no extra cost. So as you can see – the Lottery Syndicate system available from LoveMyLotto is very much a MULTI lottery syndicate system that successfully combines 5 different and popular lottery games all into one professionally managed lotto syndicate package. With no other lotto syndicate system out there that offers such a vast array of products – we are very confident that LoveMyLotto provides lotto players with one of the best lottery syndicate arrangements in which they could choose to participate in. The table below shows how you will benefit by playing as part of a LoveMyLotto syndicate as opposed to playing the games alone. We think you may agree that it offers a lot more for your money than is available from the majority of other lottery syndicates. Each of the lottery syndicates from LoveMyLotto is made up of 43 people apart from the stand-alone £1 MILLION Jackpot daily draw syndicate which benefits from the strength of 100 people. This means that whilst you are indeed getting the huge benefits of vastly increased buying power that a lottery syndicate enjoys you are – at the same time – not having to share your lottery win with too many people when you do actually win the lottery. So – this works well on both levels – very much better odds of winning the lottery but you also get to keep more of your share of the pie than many lottery syndicates will allow you to do. A sensible way to increase chances of winning lottery games such as the EuroMillions, UK Lotto and their respective Raffles.